The Food Reserve Agency (FRA) has signed a contract with the Tanzania National Food Reserve Agency (NFRA) to supply 20, 000 metric tonnes of white maize valued at US$7million to Tanzania. The continued maize exports by the PF government comes at a time the country is facing critical shortages of the commodity in the country resulting in escalating mealie meal prices. Of Friday, several Kabompo residents stormed the office of the District Commissioner (DC), Dennis Kanyakula, to protest over high prices of maize which have shot up to KR250 per 50 kg bag this month from KR100 in January. Mr. Kanyakula who confirmed the development to ZANIS also said shops in Kabompo have run out of both breakfast and roller meal for a week now. 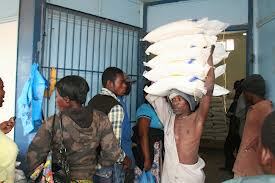 Mr Kanyakula said the residents stormed his office to ask the government to offload the Food Reserve Agency (FRA) maize on the market for the public to buy at affordable prices to avert the hunger from worsening. The maize prices in small quantities in Kabombo have also increased from KR20 per 20litre container in January to KR100 for the same quantity and cassava from K15 per 20 litre container in January to KR30. But FRA Executive Director, Chola Kafwabulula, signed the maize export contract on behalf of FRA while the Tanzania National Food Reserve Agency Chief Executive Officer, Charles Walwa, signed on before of his agency. Speaking during the signing ceremony at the FRA Head Office in Lusaka, Ministry of Agriculture and Fisheries Permanent Secretary, Siazongo Siakalenge, congratulated the two food reserve agencies for successfully signing the agreement. Mr Siakalenge stated that the transaction is meant to assist Tanzania to mitigate any chances of a shortage of white maize that is imminent in that country. He thanked the Tanzanian Government for looking up to Zambia for the supply of maize, saying this shows the confidence that that country has in Zambia’s capacity to feed the Southern African region in particular and the continent in general. Speaking earlier, representative of Tanzania’s High Commissioner in Zambia, Justa Nyange, thanked the FRA for coming to the aid of NFRA to balance the maize stock in her country. Ms Nyange also thanked President Sata for offering Tanzania an opportunity to procure maize from Zambia through the FRA. But a number of places in Zambia are currently hit by serious maize shortages including Kasama, Solwezi, Mpongwe, and major cities. The Zambian government also signed a maize export contract to Zimbabwe, and despite the Zambian government paying for it, Zambia has refused to release it to that country.